When David Limbaugh or David Mobley get going on creationism aka intelligent design you can get a good idea as to why the issue is so hot and why so many in the US have severe doubts that do not coincide with the community of biological scientists. These two Davids promote their common position in this issue in a very passionate yet restrained and rational way. If people of this caliber think ID should be taught in biology classes, surely there must be something to the argument. But then, here is how the other side views the issue. When there is a disagreement such as this, the first thing to check is whether everyone is on the same page and arguing the same topic. It is fairly clear that this is a big problem here. The clarity of position in this case belongs to those who maintain that the established means of determining curricula via academic processes is proper. The less clear position is with those who are trying to bypass the established proceedures to insert their own ideas in other ways. The less clear position is less clear because it must first explain why the process is flawed and needs to be circumvented. The implication is that there is an agenda outside of the topic at issue and it is being rationalized in response to that agenda and not to the criteria usually applied to qualification of ideas in a curricula. But how can you tell if this is so? A first step is to get a history of the debate as a basis for understanding. A Times of London Story Darwin put to flight in Bible Belt prompted a discussion on the Free Republic. To avoid endless repetition, a set of links was provided to address the commonly brought up ideas and issues. The issue isn’t the merits of evolution or creationism, it is to understand to behaviors of those pushing the arguments to try to gain insight into what causes them to do so. One way to gain an assessment of the agenda is to look at the nature of the arguments. The Limbaugh link refers to a potential conspiracy to repress scientific dialog. The Mobley link suggests a seemingly very reasonable “if schools start teaching alternatives to evolution, the caliber of our science might actually improve” with no qualifications (easily reduced to the absurd). Neither approach the basic question of who should decide curricula in schools, but they do want to override the established process. On the other hand, those who take the other side also often miss the “who decides” issue and go on the defensive. The fact is that ideas in science have to prove themselves. It is only when an idea has proven itself to be useful that it can be considered an alternative to be presented in teaching. And this leads to what is perhaps the core issue, that of definining useful. That sets the standard by which decisions are made. This is why the Patrik Henry links page starts out with definitions about the nature of science and scientific investigation. One reason why any science is taught is to convey the methods and values of scientific inquiry. The reason Steve talks about “lies” is perhaps a reaction to teaching a topic under the guise of science that does not convey its methods or values. It is the use of a conspiracy ethos, vacuous assertions of the benefits of diversity or variety to any degree, sidestepping of established process without due regard for its implications, the exceptional singularity, and other tactics that can tell you if the agenda being expressed is the one being sought. Why do honorable people push ID into public school curricula? Why do scientists in general oppose such pushing? What has what to gain? What really drives the argument? Your answer is an hypothesis. Develop your data to test it and learn its qualities. It is behavioral research. Several folks have noted a particularly promising viewpoint in Omar’s description of his voting day experience in Baghdad. Security was a big issue and well publicized. There were at least three rings with voters being subjected to two body searches before the could get to the inner ring and cast their vote. Shannon Love, in The Chicago Boyz Happy Kill a Terrorist Day noted that what some considered an opportunity was really a honey trap for the terrorist. 8 – 10 did get close and caused another 20 – 30 deaths. This was, by nearly any measure successful security. But there were two other facets that were even more important. 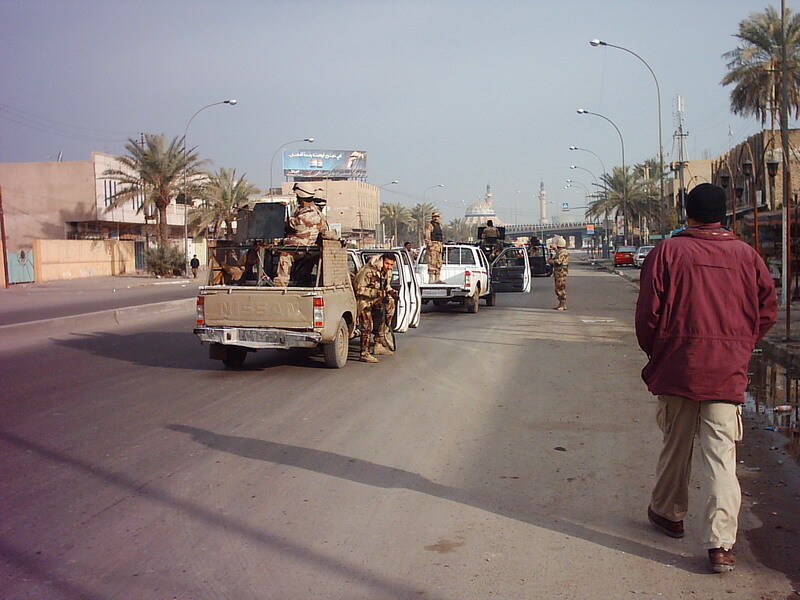 One was the low profile of the US military and the heightened presence of the Iraq National Guard and police. The second was illustrated in Omar’s observation that there is an awareness that the loyalty is due to the country and not to any particular leader. This matter of loyalty is one that people like Kerry and Kennedy do not seem to grasp. The US has a long history of learning this lesson going back to George Washington and his precedents for the Presidency and to a West Point Military Acadamy ethic that was stressed by the war between the states. From West Point it has propagated to the US military and then to the new Iraqi Guard and Police. It is an important lesson for the maintenance and fidelity of freedom and let us hope it does not get lost. It was like a slow start party. People arrive a bit late, aren’t too sure if they are in the right place, take up wallflowering, – then someone breaks the ice, starts the dance. Gradually everyone joins in and the mood grows. Pretty soon it overflows into dancing in the street. It becomes a celebration as people discover a deep seated and shared emotion about common goals and fears and they learn that they are indeed not alone. The Iraqi people have received severe threats. On January 30 they faced them and not with a grim determination but with celebration. They march in the streets but not with the hate and pessimism seen so often in the ‘anti’ crowd but with dancing and joy and relief. It is a stunning contrast between those trying to force a world into their ideologies and those who are actually making it happen. The ‘yeahbuts’ and shifting standards and other qualifications will be heard from those with alternative agendas but the celebration and joy demonstrated by the Iraqi people is one to be shared and welcomed by all. It is up to us to support and extend the celebration and to support the transition of the courage shown into a wisdom of governance. The “yes, but” technique has always been a favorite choice of those suffering dissonance. They can’t deny what you offer but can’t accept it either. So there is always a qualifier. Something that makes what they have to accept more palatable. The ‘yeahbut’ technique has become a topic of note in several quarters lately. Can he depend upon the memory hole? Re-writing the past, re-inventing history; these are the tools of propagandists. There has always been legend and song. Gutenberg started the popular spread of the written word. As technology bounces, the opportunities for people to share an accurate memory of what actually was become less expensive and more pervasive. We can hope that this will enhance intellectual integrity in the future’s representation of the past. But don’t get too optimistic. Remember the Swift Vets. They had direct memories and recordings but still suffered a damping effect of legacy media. Fortunately, alternate media did get the word out and people did pay attention. Let us hope that the sedition being espoused by current politicians will come back to face them in future campaigns. Don’t let anyone depend upon a memory hole. Hey. Guess what! Actions have consequences. The idea was to tax HMO’s as a free source of income to help pay for medical malpractice insurance premiums. The reality was that insurance rates went up to cover the tax. Will the Democrats learn that taxing evil corporations is not going to solve basic problems with malpractice premiums caused by an environment favoring imaginative lawsuits about medical practice? Feinstein considers the Carville and Begala invented ‘war room’ for the Clinton 1992 Campaign to be the beinning marker for dishonest political propaganda in the current era. It marks the beginning of a ‘win at any cost’ mentality that became a norm rather than an exception. There is worry in some circles because it seems the Republicans are not playing the game – they are not fighting the same war. The worry should be taken back to its roots. Do you trust the American Citizen? What are the implications of not trusting the citizens to be able to learn, to see what is really happening, and to make effective informed decisions? There is an old assertion that the truth will out. Will it? is law a component of a healthy democracy? In corporations, the duty of loyalty means that, once a decision is made by established means, it becomes the decision of the group. Loyalty requires that the decision be accepted and that the group move on to further business. A decision can be changed but only by accepted and defined means. A decision is not changed by antics, or by the loosing group ignoring the decisions, or by other unlawful means. What are these “demonstrations” demonstrating — other than adolescent self-indulgence and contempt for the rights of other people to go about their lives without finding their streets clogged with hooligans and the air filled with obscenities? The irony is that many of those who are indulging themselves in these strident orgies are the same people who were telling us to “get over it” and “move on” during President Clinton’s scandals. Today the liberal MoveOn.org is the last place where people are willing to move on. While this is overwhelmingly a phenomenon of the political left, the increasing acceptance of irresponsible behavior — including vandalism and violence — as a normal part of our public discourse says something about what is happening to this country as a whole. These same people are a part of the group that contained people indicted for slashing tires on get out the vote vans and ran the voting in places such as Washington, Wisconsin, and California where investigations are under way to find out why the ballot count does not match the voter count. That is past. The crimes should be investigated and perpeatrators procesuted. Meanwhile, a decision has been made and it is the loyal duty of all to make the best of that decision. It is disloyal to discredit the decision or to attempt to destroy its effect. Teacher evaluation has been a big topic since at least the 70’s when California teacher education programs stressed performance objectives (Stull? bill). These have often placed the focus on individual teachers. Modern theorists placed the evaluation on the change in behavior of the students as that was what teachers were supposed to produce. A finding noted that one of the best predictors of student college success was the first grade teacher – and waiting 20 years to find out how good a teacher is was a bit much. The NCLB (no child left behind act) changes things a bit as it puts the focus on individual schools. This moves to aggregate statistics which smoothes out some of the individual variations and accomodates the broader social influences in the student experience. It also puts a focus on school leadership – the principal – and joannej found another reference in the same vein. In the Teacher Quality Bulletin, Kate Walsh looks at how to do merit pay. The model is the analogy between the principal and the ship captain where each has the ultimate authority for his institution. Accountability runs in several directions. The principal would compete for teachers, staff, and students. The NCLB already leans towards providing choice for students. Choice for teachers also exists to some extent in district wide seniority in some places. For staff, it runs between an open market and a union hall. A good accountability scheme always depends upon one person with a clear area of responsibility. There is always the chance of incompetence or fraud, especially when strong decisions can be made with few channels of oversight. A history of gross incompetence in teacher evaluations is why union contracts have fossilized the employment relationship. School districts are now severly restricted in how they can implement accountability outcomes. The NCLB is one effort to change this. A paradigm shift such as that suggested for principal autonomy might be another. Dr. Rice was subject to an assault not seen since 1826. Why? It appears that she was subject to a partisan barrage simply to send a message. It appears that she will not be alone. Next in the bull’s eye is Judge Gonzales. Again, malicious and fraudulent attacks- and for what reason? Senator McCain says it is because of a bitterness about losing in the last election. The partisans are, of course, trying to cite more noble reasons. Whatever the reason, the partisans are now being shown for doing damage. As members and representatives they are chewing off vital parts of their own country in attempts to cover over their own dishonesty and disloyalty. It is ugly. It is a danger much greater than the threats of terrorism. The question is to what extent they will be able to continue to create such damage before they are held to account. When Senator Boxer attacks Dr. Rice with false memories of the congressional resolution, Senator Kennedy and others allege “mislead” and other malfeasance despite their own votes and past words, and Senator Reid contests the result of the vote, we see that the fight for liberty is not so much in the blood of soldiers but, once again, in the integrity of citizens and their representatives and their propagandists. The fact is that votes do matter and the results cannot be minimized by qualification. You might wonder about the vote when the dead and the criminal are found to have voted in Seattle, when Wisonsin voters who registered at the last minute have fictitious addresses, when indictments are filed for slashing tires of GOP get out the vote vans, when allegations of disenfranchisement are made indiscriminately, – and when all of these incidents of malfeasance indicate a correlation to Democratic partisans – but they will be resolved eventually. The fact is that once a vote is made, whether for war or for office, the inability to accept that vote in a matter such as Senator Reid has advocated is a corruption of the process and contributes to, and is a part of, the fifth column effort to defeat what has been built. These efforts to subvert liberty and freedom will be difficult to counter if we allow the history of Vietnam to repeat. You can’t do model rockets anymore as the engines are considered explosives. Photography has gone digital and taken the magic out of the emergence of an image in a bath of chemicals. Amateur radio has been made pass’e with cell phones and cheap walky talkies. No risk, no gain. We cannot let our children go, we cannot delegate if it means they may find out about the real world in an unpleasant way. What will we get? There are those who say you can’t fight a war on terror because terror is a tactic. This brings to mind those who confuse ideology, strategy and tactics as in trying to understand the recent inauguration speech. But then, when you look at this list of actions in the war, you can see that the war that is being fought is not just about terror, it is about honor, morality, ideology and intellectual integrity. And the list of actions demonstrates that wretchard may be right. It is not a matter of simple disagreements but rather something that will be won with definition. New dietary guidelines – big bro approaching? The new federal guidelines for your diet have now expanded to include how you should exercise. There is a questionable assumption behind these guidelines that is very popular. Count your calories. Measure your exercise by calories burned. Engineer your weight and musculature. We are all the same and all it takes is simple calculation to learn what you have to do to achieve your goals. Do that and you are guaranteed success. But, as many have found out, it doesn’t work that way. So the calorie counting presumption is then used to heal guilt and further complicate matters. Oh my, do we have another case of misguided misperception? The fact that the dialog about evolution continues should be considered an indication that the dialog is not about evolution but something deeper. This ‘something deeper’ drags the teaching of science into a quagmire. Just as my grandfather jumped from my statement that Jesus drunk wine to the conclusion that I was calling Jesus a drunkard, a subset of American Christians similarly jump to the conclusion that if science contradicts the literal words of the Bible, it must be part of some secular humanist plot to discredit religion. Because of the dissonance created between ideas of evolution and their own beliefs and desires, there are some people who go to great lengths to foist their own views and diminish ideas of evolution. In doing so, they abandon a basic concept in science that ideas stand or fall on their own; they promote their own ideas by trashing others and not by establishing the value of their own using accepted standards. Recent expressions of this dissonance sought out “many” scientists who questioned evolution in an attempt to dimish is lustre, obsessed on flaws and faults to ‘prove’ Darwin’s ideas are wrong; went into length explanations to explain their own views as being what they were not. Just as Jesus answered a question by suggesting that what is Ceaser’s be left to Ceaser, those who are foisting belief on science should leave evolution to the biologists. Hiding the agenda, and even going so far as to rename it as a means to address criticism, do not help resolve anything. Until a basic honesty, an intellectual integrity, invades the discussion it will remain a fruitless and continuing argument. Getting to the truth of the matter can be a bit more difficult than listening to what is fed through the MSM or listening to Senator Boxer in a confirmation hearing. According to anti-war leftists, as well as a few frustrated conservatives, America’s losing the war in Iraq. I’ve repeatedly shown this perception is wrong, and not shared by Iraqis. Anyone genuinely interested in the facts should review three sorts of sources: military blogs (Glenn Reynolds lists some), Iraqi blogs (such as Iraq the Model), and Arthur Chrenkoff (whose weekly Extra round-up alternates between Iraq and Afghanistan and also appears on the WSJ’s Opinion Journal). The Senator did not correctly represent the resolution she quoted in order to impugn the integrity of a nominee. Even Senator Kerry in the same hearings had some problems with what he remembered about allies and offers of help and assistance. 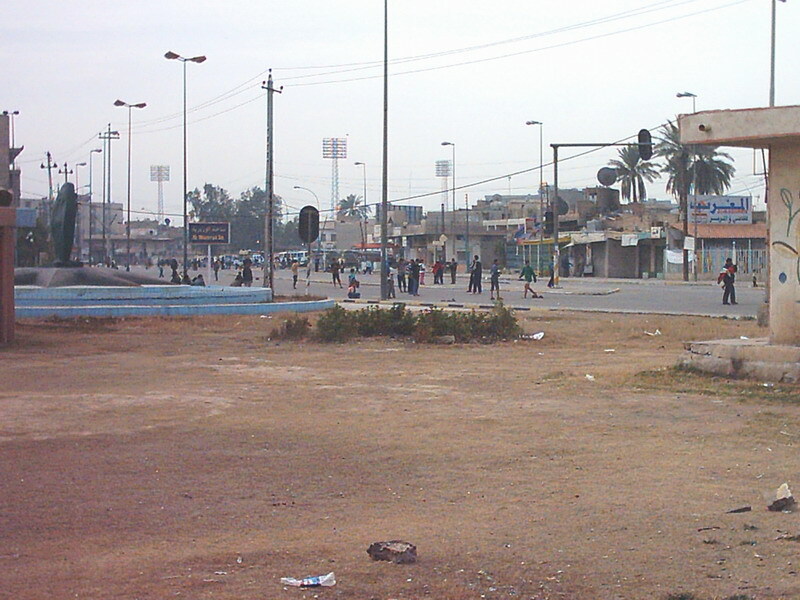 The common thread was doom and gloom and pessimism about Iraq. Try the links. Go find out for yourself just how bad it really is. You might be surprised and end up hopeful. The has been a lot of talk about media bias and a lot of denial that such a thing exists or that if you see bias I see it too but opposite. The fact of bias is something that should be assumed. It is one of the first topics in any education about a field depending upon observation. The issue isn’t bias itself but what it can do if not accepted on the part of the observer. On the one hand is the subtle propaganda of what is reported and how versus what is not reported. On the other hand is a fabrication such as in Rathergate. The reason that bias is such a big issue in news sources is that there is a pattern of deception and even fraud to the point that the masses are being subject to propaganda and not news. Bias isn’t really a problem. Lack of intellectual integrity is. The Supreme court recently decided that the detailed guidelines developed to help assure consistent sentencing in federal criminal cases created an impromper situation. Judges needed to know a lot of things, like past criminal history, that were not appropriate to know before the trial took place. So, the effect is that judges are no longer bound by those guidelines and we are back to unrestrained judicial power in sentencing. So, the inquiry turns to Congress. What are the pressures and motivations here? The Supreme Court has taken a constitutional flaw in the Guidelines (which were meant to restrict judges) and fashioned a remedy that keeps the Guidelines in some sense but restores discretion in sentencing to the judges. The judges are “elated,” but Congress may want to reassert its control over the judges. As noted in the linked article (by Carl Hulse and Adam Liptak in the NYT), just last year Congress started requiring the United States Sentencing Commission to feed it information about which federal judges weren’t following the Guidelines, an attempt to control those terrible federal judges who have the audacity to imagine that they occupy an independent branch of the federal government supposedly accountable to something they arrogantly call “law” and not to the will of Congress. So here we go into a new season of judge-bashing (and, from the other side, judge-defending), which should go quite nicely with whatever new judicial nominations may happen to come up. the full text of the case … Here‘s Instapundit glancing around and finding the Sentencing Law and Policy blog, which obviously has to do this one and can’t do the hey-don’t-look-at-me routine. Volokher Orrin Kerr has a lengthy discussion of what he sees as the root problem with this and similar cases, namely, the court dealing with problems within the purview of the legislature through imposition of structural rules. While this decision is ‘only’ for the feds and not for the states, it appears to do two things that are not good for a legal system. One is that it puts the judiciary over the legislature. The other is that it makes consequences of behavior less determinate. One’s fate is more likely to be determined by choosing a judge than it is by the crime and the behavior of the criminal. The fourth estate is a part of the fifth column. To see this, you can contrast the stories you see in the MSM with a series looking in the other direction in Iraq by Chrenkoff. You can also take a look at one such comparison that has been done for you with a conclusion about its consequenses. The first indications that something was going seriously wrong in Vietnam started to be noticed about two years into our “advisory” role in that conflict. Around 1963 young reporters like Niel Sheehan and David Halberstam started getting interviews from battlefield commanders like then-Lieutenant Colonel John Paul Vann that directly contradicted the far rosier accounts coming from Saigon and being reported without question in the mainstream media. Whatever the reasons or the motivations, the fact is that we are now able to more easily find out what is really going on – if we engage in an exercise in intellectual integrity. We can weigh different sources, differing views, and differing opinions to determine what is really going on and how certain we can be that we have a good insight. You no longer have to depend upon Cronkite distance but can find first hand accounts and a multitude of analyses to help you be effectively informed in your own views. The report on CBS’s woes has prompted some attempt to clarify its weaknesses as examples for critical thinking exercises and the theory of logic. a standard of proof requiring metaphysical certainty and the withholding judgment so long as contrary conclusions are theoretically possible is ludicrous. Indeed, it is a standard that the report applies nowhere else other than to the sensitive issues of document fraud and political motivation. And then a worry about what those who do not engage in critical thinking might think. And a reason for this worry.